I’ve been feeling a bit introspective the last few days. The honeymoon feeling has worn off and the still left-unpacked boxes are starting to make me feel a bit squirrel-y and a teensy frazzled. It was enough to move in. The kitchen, especially, needs more organization. While it was one of the first things to be unpacked, the cabinet space is strange and tall and narrow, and every time you open a cabinet there is a very real fear that something will come crashing down on your head. If I was totally honest, my life feels a bit like that kitchen. The move was an answer to a desperate prayer, a laying out of fleece, a begging for direction. Our life had begun to feel like suspension bridge spinning in a hurricane. The tension was so fraught that the tiniest thing could have sent our little cars of life flying hard into the ether. Spun up, strung tight. Trapped. Beleaguered. Stuck. These are the words that ring true to me as I consider how things felt before the new job and move became a reality. We had struggled for ten years to form a community around us. James loved the people he worked with and what he did in his job, but the pay and benefits were locking us into continual poverty, with no chance of pay increases or advancement. It was dead end. Our housing situation felt similarly dead-ended. We were barely making ends meet in a house that, while large, couldn’t provide for our needs properly and was falling apart around our ears with a landlord that wasn’t listening. But where else were we to go? We had looked and looked for a place that would work for us within the area and would return back to our current rental with dejected mein, realizing that this was it. Our locked-in finances barely covered the basics like groceries and gas; there was no way we were ever going to be able to save enough to buy a house again. The reality of it all was very difficult to deal with. Dejection courted us in the shadows. The marriage began to show the cracks and strain of all we were trying to hold together. We were caught up into safe refuge and harbor by steadied arms who pulled us in. Even thinking of it now, I try not to sob outright. Someone cared about us so much that he fought for us when we could not fight for ourselves, prayed over us and for us, and helped us back to our feet in ways both spiritual and practical. It was during this time of renewal and repair that we realized that, as much as we loved the area, we needed to cast our nets farther afield. Three cities were chosen, each for different reasons, and applications were filed. The prayerful waiting began. I don’t think we were particularly hoping for one outcome over the other- more than anything, I think we both had a very real fear that nothing would return. Nearly a month and a half passed, and we both began to struggle with doubt. A week to the day after we had a particularly rough day and given it all up for lost, things began to happen rapidly. First one interview, and then another, a phone call, inquiries made. Just like that, a job. Less than twenty four hours later, and at the head of a list that included three other families, a house. You will believe me when I say that everything fit together in ways we could not have even begun to conceive of. It practically seems made to order. The thing is? I think it was. We had to let go of everything before it could happen, surrender everything we are and wanted, to come to the end of ourselves and let it all go, release it. Here is the truth, paraphrased by Eugene Peterson in the Message: “Give away your life; you’ll find life given back, but not merely given back—given back with bonus and blessing.” (Luke 6:38) The delight will overwhelm you at times like drinking from a fire-hose, and yet you couldn’t realize how very thirsty you were till someone turned the thing on. All that said, there’s still a lot of things to unpack. There were patterns and choices that let to the virtual prison we had made for ourselves. There was a reason things felt so spun-tight. We must, must, must forge a new path here, with the Lord’s help. What that is and what the looks like, what new choices and rhythms must be made- these are the things filling my thoughts these days. 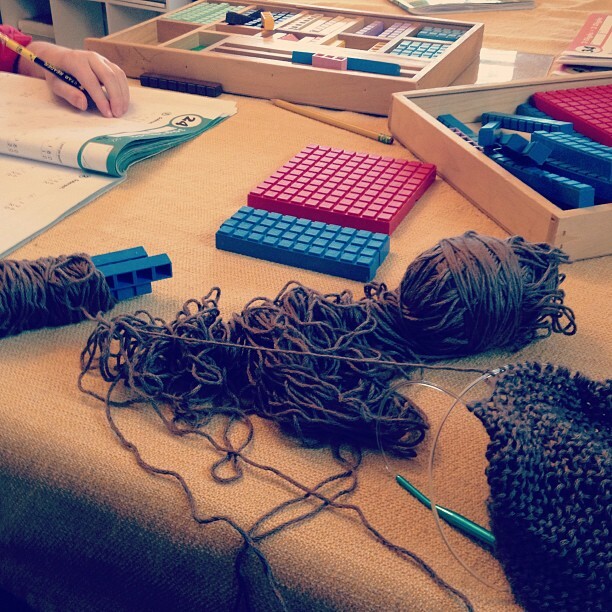 I snapped this picture yesterday, of the boys untangling math problems and my knitting ball that had become hopelessly entwined…it took me most of the day that day to straighten it all out, but this is the thing that I love- it was able to be untangled. The light bulb comes on in the math lesson and we stretch forward to the next idea. I treasure the photograph because it reminds me that life moves forward, even when it all looks messy. Beautiful! It’s so good to hear testimony of how the Lord caught you. Your story and your testimony are such an important part of the gospel going forth into the whole world, for all people. Thank you for your faithful honesty, friend.